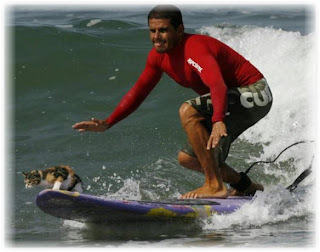 I have seen several dogs surfing with his owners. I must confess this is the first time I see a cat doing that. 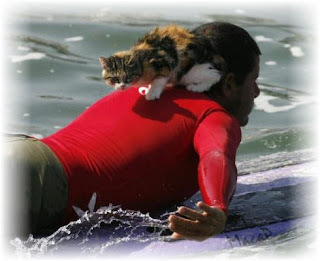 According to the Italian newspaper, La Repubblica, these curious images are from a beach in Lima, Peru (San Bartolo Beach) where the surfer Domingo Pianezzi practices with a friendly cat, Nicolassa. I am not sure if Nicolassa is enjoying it and looking for food (looking in the water thinking "ooooh, fresh food!") or if she is scared like hell of getting even MORE wet. 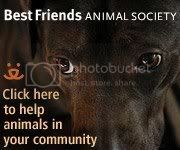 Great pictures nevertheless! 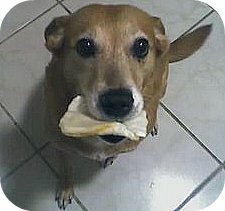 UPDATE: A friend of mine (a real cat person) just sent me an email with her thoughts when seeing the pics. I guess because I am a dog person I never thought about it, but she is totally right when she says: "I am not sure that little cat is enjoying the ride. 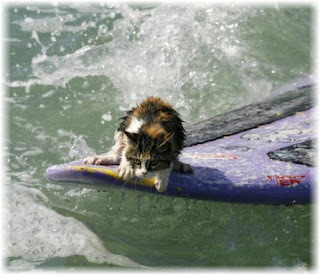 What I am sure is that the surf board has now some claws in it and a good number of scratches!" .